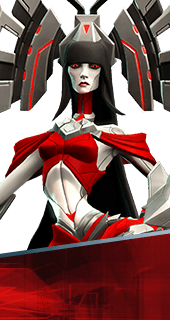 Flame Shield is an Ability of Ambra in Battleborn. When Ambra's health falls below 20%, she is protected by a Flame Shield for 4 seconds that provides 450 Overshield. 30 second Cooldown. Ambra gains increased speed when her Flame Shield is active. +60% Movement Speed. Ambra’s Flame Shield explodes on expiry, damaging nearby enemies. +280 Damage.